As my usual two year Vodafone contract was coming to an end, it was time to renew, and pick a nice new phone. It became the HTC Touch Diamond. Mobile phones and me go way back. Back in 1998 I started with the Siemens C25. Within a year or so I switched to a subscription instead of prepaid, and got one of the first nice clamshell type phones, the Motorola V3690. Two years later it was upgraded to a Motorola V66; I really liked the clamshell design. 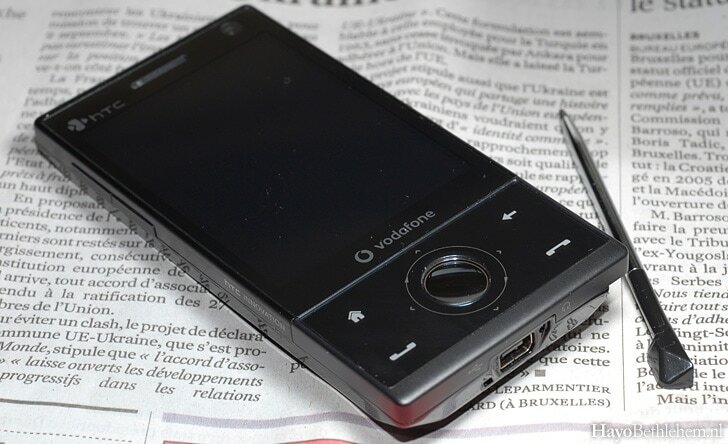 Two years after that, Motorola suddenly stopped producing interesting designs, and I switched to Samsung with the E710. This was to be the last in my clamshell streak: two years after this acquisition, there weren't any nice clamshell phones any more. So I switched my preference to slidephones, and got the thinnest one on the market back then. And so another two years had passed. And I wanted to upgrade again. But what to pick? the successor to my U600 wasn't really interesting enough. All other phones on the market were really boring. The Iphone hype made me wonder if a smartphone would be something for me, but the Iphone was just too big and limited for me. Having had some prior experience with Windows mobile, I started researching that market. I wasn't really interested in email functionality, so the Blackberries were dropped from the list. All other devices were really uninspiring and BIG. I'd almost lost all hope. That's when I discovered the HTC Touch Diamond. Some people might call me a hypocrite, as I've always bashed smartphones. "I only use my phone for calling and text messages", I'd say. I've stood by that opinion for a long time. Even as a photography nut, I never used the built in camera of my phones much. But times change. My habits change. I'm more on the road, have more need of a calendar, and of course, still am interested in new cool devices. That's where the Diamond comes in. It has all the cool acronyms. GPS, UMTS, HSDPA, Wi-Fi, etcetera. It's small and thin. In fact, the size difference between it and the Samsung U600 are minimal. It has satellite navigation built in. There's google maps included. Its screen has a massive resolution. Easy office syncing, and finally, Vodafone offers flat fee internet access. Which for me is a reason to actually use internet on a phone. Oh and it's back looks kinda like a stealth bomber, which is neat. I really like Google maps coupled with GPS. It will make my life so much easier. Also, I was in a traffic jam the other day, and I just used maps to discover the surrounding countryside. "oh hey, so that's that lake!, cool, more windmills there! Ahh, this is where Stompwijk begins!". The included Tomtom 7 software was a bonus I wasn't aware of. I tried it yesterday, it worked fast and accurately. The phone is small, and fits in my pocket without leaving a strange bulge. The touch screen interface is very responsive. Opera mini was bundled as browser, and was better then I expected. CSS rendering is excellent, interface zooming works great. Typing text messages is so much faster; I never learned the whole crazy thumbs thing. I use the touch screen QWERTY keyboard now. I like how the cute little stylus is magnetically sucked into the phone. If you want to do too much at the same time, it gets slow. The battery life I'm still getting used to. My previous phones could last two weeks without recharging, this one I have to recharge every day. Which is not necessarily a Touch Diamond problem, but something I expected when buying a smartphone in general. I'm considering if I should get another standard sized, or a bigger battery (with matching bigger backplate). HTC released a firmware update for the phone, improving battery life and application speed. Unfortunately, Vodafone NL hasn't released its own branded version yet. I've read reviews of people claiming the screen is too tiny. I disagree. Yes it is small, and the fonts are likewise, but I like that! I'm used to a 12 inch laptop screen so my eyes have become used to small type. Application speed. No it's not a dual core 4gig RAM system. Yes it's Windows Mobile. But I don't care. I'm not expecting desktop performance from a small smartphone. The phone hasn't crashed yet. Stability issues might be a problem just like on Windows XP: If you install a lot of garbage, it will become unstable. If you don't , it won't. I like the Diamond. It performs like I expected, and it beats the competition on all points that matter to me. It's nice and light, and has all the functionality I wanted. I'm happy.